Coronavirus virion. SARS is caused by a novel coronavirus (original image is 3210 pixels across). CORONAVIRUSES AND SARS (Severe Acute Respiratory Syndrome): A new type of coronavirus has been identified as the cause of the emergent disease called Severe Acute Respiratory Syndrome or SARS. The "SARS Virus" was officially declared the causative agent on 16th April 2003 by the World Health Organisation. The genome for this novel virus was sequenced by various groups just prior to this announcement. 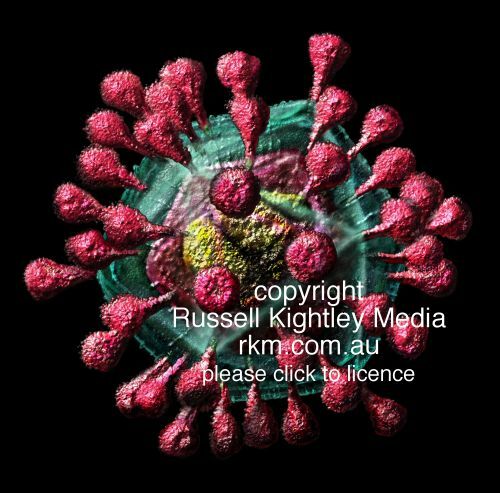 see our coronavirus image featured on the Australian ABC website (also shown on the ABC television news "World at Noon" 22/4/2003).